Blackberry Viewer Beta | BlackBerry Blast! Idokorro has released a new beta version of their Blackberry Viewer program. 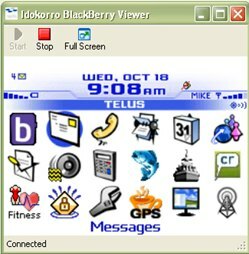 BlackBerry Viewer is an application that works with the Desktop Manager and allows you to view the screen of your BlackBerry handset on your computer screen. The download is free but because its still in beta it will expire on January 15, 2008. In order to download the beta Idokorro asks that you fill out a survey. Once the survey is done you can download the application for free.